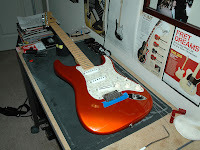 After the resounding success in cutting a new nut for the used Music Man Sub1 I recently purchased, I decided to go ahead and replace the nut on my '02 Candy Tangerine American Deluxe Stratocaster. Some years ago the original nut was replaced with bone by a local luthier soon after I bought the guitar, but I quickly realized how badly bone nuts can bind with tremolo use so I had it changed to Graph Tech by another local luthier. This nut was very poorly installed, with a large empty space underneath most on the length of the nut! This practically killed most of the open string notes on the guitar. Cutting the new nut took me two tries to get right, mostly because of the funky nut slot in this guitar. It was not a nice, neat slot like the one on the Music Man. I finally got a good fit and I am very pleased with the result! Of course, I used my favorite nut material (Slip-Stone) since it works so well with tremolo use... plus, it is creme colored for a stock Fender look. Next I took off the horrible Graph Tech hybrid saddles I installed some time ago and went back to the stock stainless steel bridge saddles the guitar originally came with. Not only do these sound better, but with a small application of 3 in 1 oil on each saddle at the point of string contact they also bind less than Graph Tech saddles. No kidding! One last thing I did was to put back the original string tree that came on the guitar. My goal with the nut material color, original saddles and original string tree was to get the guitar back to its stock look. And I succeeded. 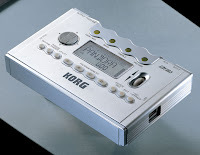 ;) It plays and sounds better than ever. Yes! It finally happened... I got a Tyler. I've been wanting one of these for a couple of years now, but I could never just pull the trigger and buy one. It turns out that Jim Tyler is now sick with a number of ailments and the future of Tyler guitars is uncertain. It is rumored that he may even decide to stop building instruments altogether, so naturally I just had to snap this one up when it came along. A very nice friend from the Gear Page (that also lives right down the road from me) grabbed this brand new beauty at a guitar show in Nashville, TN over the weekend (this guitar was unplayed and still in factory packing). At $3200.00 and some change the price was slightly less than retail with no tax, which I was happy about. ;) This particular specimen is a Candy Apple Red Classic model with a covered humbucker in the bridge position and two singles in the middle and neck with a 5 way switch, a volume and two tone knobs. It has a Wilkinson vintage tremolo bridge, standard Graph Tech nut and awesome quality Kluson tuners that I've never seen before. Not sure if these are Schaller, Sperzel or Grovers... but they are very nice tuners. The whole guitar is a work of art from the ultra smooth finish to the precise fretwork and perfectly sculpted neck and body. It is a real pleasure to play and it sounds fantastic! The bridge pickup is low output, very clear and not too bright (not sure yet if this one is a Tyler creation or a Duncan). However, it sounds more like a single coil on steroids than a true humbucker. The two single coil pickups are almost certainly DiMarzio Virtual Vintage singles. I have two of these in another Strat and so I am pretty familiar with them. The overall sound of the guitar is nice and dark with Stratty overtones... this is definitely a modern sounding Strat... no ice pick here. This a pure progressive rock, fusion guitar with plenty of balls for when you need it, but still gentle and elegant when you're going for the melodic lines. This is a fantastic guitar and I am so happy to finally have one in my collection. I waited to the last minute to buy one, that's for sure. But had I bought sooner I'd have surely paid too much, so it really did work out in the long run.